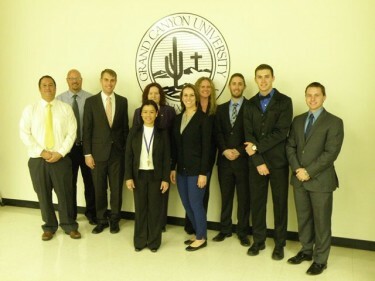 Five sets of presenters at the seventh Delta Mu Delta Honors Symposium introduced their respective studies on the topic of ethics Monday at the Williams Building lecture hall on the Grand Canyon University campus. Delta Mu Delta is the honors society for the Ken Blanchard College of Business at GCU. At least two of the presentations are expected to be further developed in time for the annual Research Colloquium in the spring. Honors Symposium presenters (from left) John Steele, Richard Holbeck, Alan Guthrie, Maria Quimba, Dr. Anita Crockett, Shaunna Allum, Shanna Huslig, Elliott George, Tyler Owings and Lance Rao. About her: Associate professor at GCU’s Tucson site. Doctorate in nursing research and educational administration from the University of Texas. Summary: Temperament theory says that in behavior and conversation, the core values of an individual are revealed, especially under stressful circumstances (often found in health care). About them: Both online full-time faculty at GCU. Holbeck is director of online full-time faculty. Summary: Ethics can be embedded in online curriculum through modeling by instructors, creating a caring classroom, emphasizing the importance of integrity via real-life examples, and integrating faith. About them: All are students in the Ken Blanchard College of Business. George and Rao are seniors; Owings is a junior. Summary: Previous studies show that male students and younger students are more accepting of ethically questionable behavior. Honor codes and specialized ethics courses can be successful in improving ethical behavior. The trio’s own study is in the works. About her: Assistant dean of professional studies for the College of Nursing and Health Care Professions at GCU. Summary: In a new approach to the instruction of nurses, critical thinking and context are more important — and memorization no longer is sufficient. About them: All teach in the Ken Blanchard College of Business. Summary: A qualitative research study of 20 Phoenix-area instructors will examine the correlation between teaching ethics and an instructor’s commitment.